Our translational research focuses on molecular imaging and drug delivery as a theranostics tool. Molecular Imaging allows visualization of not only organs and cells but also biochemical processes within the cells that are associated with specific disease. This information can improve the accuracy of a diagnosis, provide better assessment of the severity of disease and even monitor the response to therapy. Molecular imaging approaches, such as nuclear (including PET and SPECT) and near-infrared fluorescence, have been applied to understand the molecular basis of diseases, biochemical processes, gene delivery and expression, tissue receptor-ligand activity, enzyme mediated processes, drug discovery, monitoring novel therapy techniques, etc. Our laboratory has been developing image guided therapy and dosimetry for cancer. 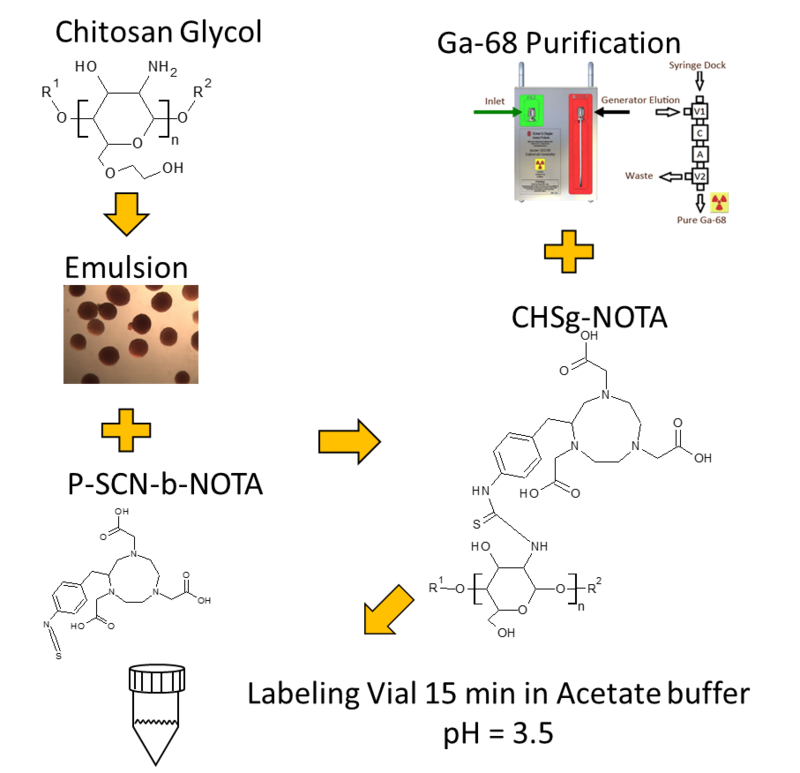 We have developed micro and nanoparticles for imaging and therapy of cancer and image processing methods for improved dosimetry for therapy planning. We have developed PET radiochemicals that report regional metabolic/functional variables of various organs or tumors, and examine their cellular uptake kinetics. In addition to clinical studies, tests are conducted in whole animal, isolated organ and isolated cell models. We are developing tools for automatic segmentation and registration of organs and tumors to accurately determine tumor functional and anatomical volumes which is required for accurate dosimetry calculations for Selective Internal Radiation Therapy (SIRT) planning. A schematic of an ideal drug/imaging agent carrier for image guided therapy. 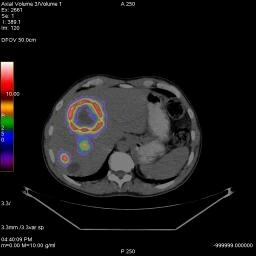 Selective internal radiation treatment (SIRT), a technique used to treat metastatic liver cancer, could also benefit from a PET perfusion tracer. During the planning stage, a 99mTc-MAA perfusion scan is performed to assess the allocation in lung and gastrointestinal tract. It is also used to calculate tumor to normal liver allocation ratio. The distribution acts as a predictor of the treatment safety and effectiveness. A PET perfusion agent (e.g., 68Ga-MAA) was developed that could provide valuable, quantifiable information to calculate precise doses, which could potentially improve the treatment outcome. Fast biodegradable (12 h < half-life < 48 h) radioactive labeled microspheres are needed for PET and SPECT lung perfusion and radiomicrosphere therapy and therapy planning. We used an emulsion method to synthesize microspheres with biodegradable Chitosan glycol (CHSg). Microspheres were characterized and labeled with 99mTc or 68Ga as an alternative to MAA in perfusion PET and SPECT studies. The particles were also co-labeled with Y90 for therapy. Surface decoration of CHSg microspheres with p-SCN-Bn-NOTA was performed to increase 68Ga in vivo stability. 99mTc was labeled directly to the CHSg microspheres. p-SCN-Bn-DOTA was used for Y90 labeling. Labeling yield and in vitro radiochemical stability were evaluated. 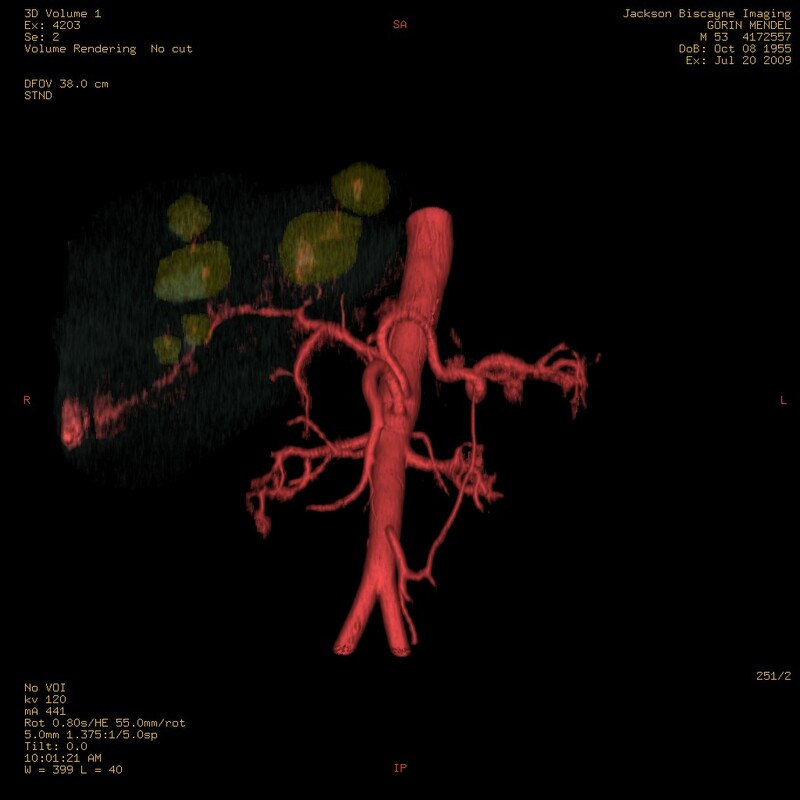 Clinically, accurate liver volume determination for therapy planning is most often accomplished through tedious manual segmentation of the entire computerized tomography (CT) scan, a task greatly dependent on the skill of the operator. Automatic/semiautomatic approaches are thus geared towards segmenting and determining the volume of the liver accurately while facilitating the operational process from a clinician/physician’s viewpoint. We developed a novel liver segmentation approach for estimating anatomic liver volumes towards selective internal radiation treatment (SIRT). The algorithm requires minimal human interaction since the initialization process to segment the entire liver in 3D relied on a single computed tomography (CT) slice. The algorithm integrates a localized contouring algorithm with a modified k-means method. The modified k-means segments each slice into five distinct regions belonging to different structures. The liver region is further segmented using localized contouring. The novelty of the algorithm is in the design of the initialization masks for region contouring to minimize human intervention. 3D-Model of liver tumors and supplying vasculature. 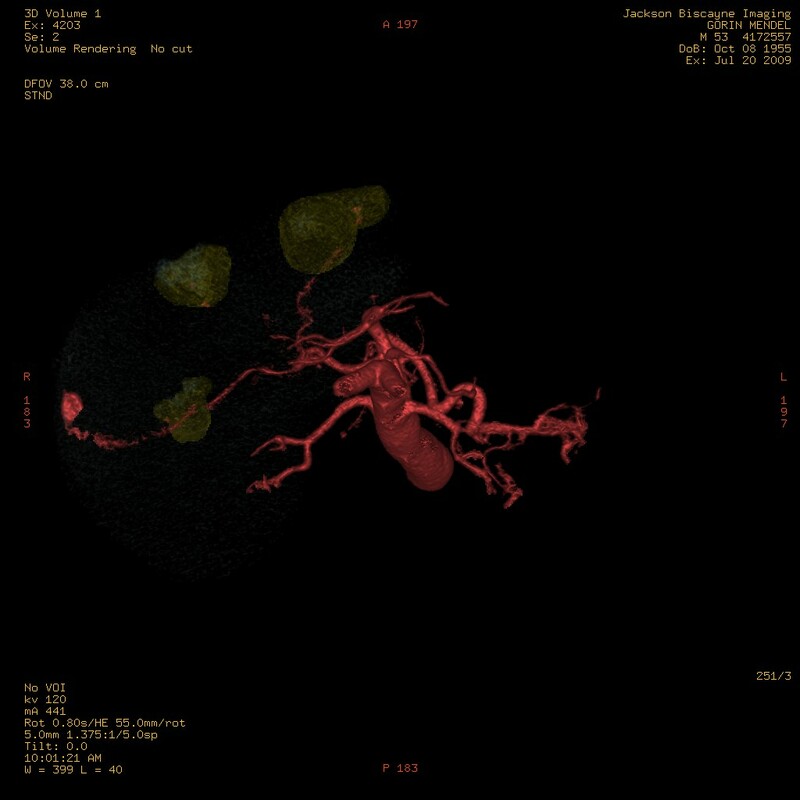 Representation of the tumor and liver perfusion field. Selective treatment of individual lobes requires multimodal imaging (metabolism (FDG), perfusion (MAA) and anatomy (multiphase CT angiography). Clinical evaluation and quantification of proliferative activity and tumor invasiveness can be performed using 3’-deoxy-3’-(18F)-fluorothymidine (18F-FLT) PET imaging. 18F-FLT works as a terminator of the growing DNA chain. Actually little 18F-FLT is accumulated in DNA, it is rather retained intracellularly after phosphorylation by thymidine kinase 1. This is analogous to the imaging of the glucose pathway with 18F-FDG after trapping by hexokinase. Both compounds therefore reflect accumulation by transport and subsequent activation by the first step in the utilization pathways. However, 18F-FLT does not reflect the whole of DNA synthesis just as 18F-FDG does not reflect the whole of glucose use. We examined the imaging characteristics of pancreatic cancer patients to determine the correlation between the metabolic and proliferative activity of pancreatic cancer using FDG and FLT PET images, respectively. The parameters of interest were functional tumor volume (FTV), Total glycolytic index (TGI) and Total proliferative index (TPI). FTV, TGI and TPI were determined from both FDG and FLT PET images. These parameters measure the metabolic and proliferation activity of tumors using FDG and FLT PET/CT images, respectively, which have clinical value in the assessment of tumor biology, prognosis, response to treatment evaluation, and patient selection for therapeutic interventions. Senait Aknaw Debebe, Mohammed Goryawala, Malek Adjouadi, Anthony J. McGoron, Seza A. Güleç. 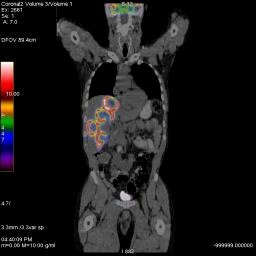 18F-FLT Positron Emission Tomography/Computed Tomography Imaging in Pancreatic Cancer: Determination of Tumor Proliferative Activity and Comparison with Glycolytic Activity as Measured by 18F-FDG Positron Emission Tomography/Computed Tomography Imaging. Mol Imaging Radionucl Ther 25:32-38, 2016. Mohammed Goryawala, Seza A. Gulec, Ruchir Bhatt, Anthony J. McGoron, and Malek Adjouadi. A Low-Interaction Automatic 3D Liver Segmentation Method using Computed Tomography (CT) for Selective Internal Radiation Therapy (SIRT). BioMed Research International. vol. 2014, Article ID 198015, 12 pages, 2014. doi:10.1155/2014/198015. Goryawala M., M.R. Guillen, S. Gulec, T. Barot, R. Suthar, R. Bhatt, A. McGoron and M. Adjouadi, An Accurate 3D Liver Segmentation Method for Selective Internal Radiation Therapy Using a Modified K-Means Algorithm and Parallel Computing. Int. J. of Innovative Computing Information and Control. 8(10):6515-6538, 2012. Goryawala M., M.R. Guillen, M. Cabrerizo, A. Barreto, S. Gulec, T. Barot, R. Suthar, R. Bhatt, A. McGoron, M. Adjouadi. 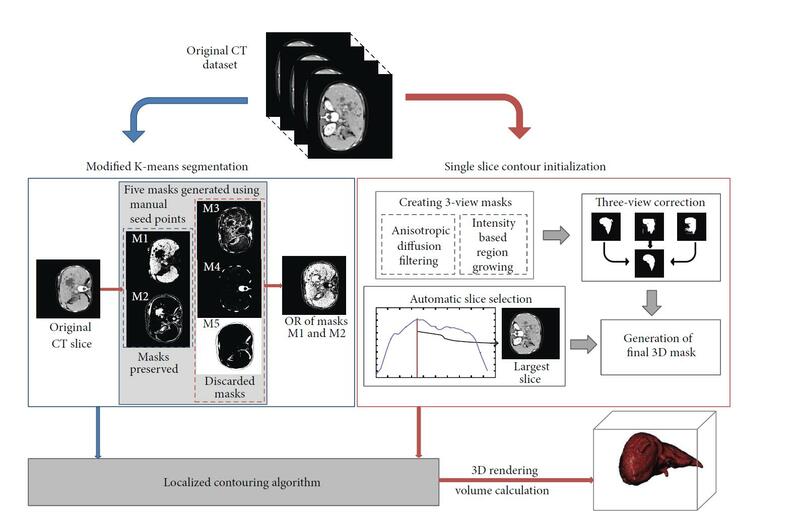 A 3D Liver Segmentation Method with Parallel Computing for Selective Internal Radiation Therapy. IEEE - Transactions on Information Technology in Biomedicine. 16(1):62-69, 2012.